As you may know by now, I’m a Tapping junkie! Tapping, otherwise known as Emotional Freedom Technique (EFT), is a psychological acupressure exercise that supports your emotional health. By tapping on specific energy meridians on your body, you can unblock ancient fears, limiting beliefs and negative patterns. My friend Jessica Ortner, one of the founders of The Tapping Solution, is taking tapping to a whole new level! Jessica just launched her first book, The Tapping Solution for Weight Loss and Body Confidence. In this video I sit down with Jessica to talk about the book and share a Tapping session with you! If you’re struggling with body confidence, weight loss or your relationship with food, then watch this video now! 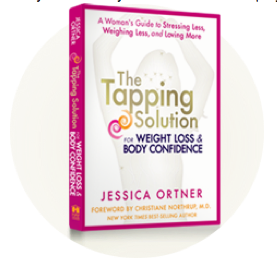 For more guidance on using EFT Tapping for body confidence and weight loss, check out Jessica Ortner’s book, The Tapping Solution for Body Confidence and Weight Loss. In the book, Jessica goes into the science and research around the effect that our emotions have on our weight, as well as the results she’s getting with people using EFT Tapping for body confidence and weight loss. Learn this incredible tool and change your relationship to your body forever. I love jess so much and this is my same issue, especially standing up and eating while I’m cooking and then by the time I eat I’m not even hungry. It feels uncontrollable and like tapping is the solution I’ve been after. Oh yep, definitely need this one.. This is such a simple, but powerful tool! I love tapping, and this is a great way to use it specifically for body confidence, which I think everyone could probably use more of. Thanks for sharing, Gabby! Good stuff! After watching your video on tapping for stress I added it to my routine. This video was helpful and I will use it to slow down n not rush through everyday tasks and eating. Thank for this Gabby! I’m going to get my hands on this one. I’ve known about tapping for a long time, but now I finally feel that I am open to this concept and all that it has to offer me…. I love this technique and will definitely pick up a copy of her book, thank you Gabby! Wow! I am totally a fast eater too. I’ve never actually looked into the root cause of this, but I tapped along with you and felt a complete opening of my heart. It was like light floating in all around my heart. Lovely. I never pay attention to my body while I’m eating, so I don’t even know how it will feel, but I’m going to use this tapping sequence at my next meal. Wow – I need this – it is so helpful to see and hear that other people have these issues – what Jessica said about if you are feeling frustrated then it’s time to try something different – that is SO me, I have been emotionally abusing myself for decades and so want to move past this! And Gabby – what you said about being thankful for where I am as it has brought me to this much needed place of change and acceptance – that was so nice to hear – it allows me to forgive myself for all the years of negative self talk – thank you both so much! I can’t wait to learn more! Thank you for this great vlog! Can’t wait to check out the book! I have a question, I have issues with food because I have an autoimmune disease, Hashimoto’s and I feel like I am not supported in my healthy eating at times when I fall short of my good way of eating and that makes me want to act out even more with my eating. How can I handle this? And how can I handle my wanting to eat bad due to emotional triggers. you a shout out from Lubbock Tx! Just wanted to tell you keep up the fantastic job! say about this piece of writing, in my view its actually awesome in support of me.